After his departure from Rage last year, the band he’d been playing guitar for since 1999, Victor Smolski was not content to rest on his heels, forming a new project almost immediately with a host of talent that includes Brainstorm vocalist Andy Franck and Lingua Mortis Orchestra’s Jeannette Marchewka, not to mention help from the Orquestra Barcelona Filharmonia. And this is the first full-length from (the oddly-titled) Almanac; a concept album about Ivan the Terrible of Russia. It’s less thrashy and more orchestral than Rage, even before you take into account the three (!) vocalists, two male (David Readman of Pink Cream 69 alongside Franck) and Marchewka, who generally form a pleasing chorus and each get their own moments to shine. More than catchy enough for my tastes, with nicely restrained orchestration, Tsar is a great debut that will please fans of the style and maybe even convert a few doubters. It has faults, of course, mainly the concept album trappings which while give the music a historical taste can’t help but drag it down a little when indulging itself – the opening title track is a great example of this, decently heavy riffs and some terrific lead guitarwork from Smolski (the anchor of the band and a hell of a player) but some of the verses taking a little too long to get to the point, as good as the singers are. Also, at nearly eight minutes long, it’s just a bit longer than it should be… Fortunately the following Self-Blinded Eyes makes up for this immediately with one of the most infectious choruses on the album, Avantasia-threatening in how passionately singalong-inducing it is. Giving a good chunk of the second half of the song over to guitar pyrotechnics from Smolski doesn’t hurt, either! 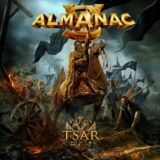 Almanac are best when heading towards Avantasia territory, really, with the chugging Hands Are Tied mixing metal heaviness with the operatic vocal variety effectively – you can tell the band know their strengths, as they play to them constantly. Highlights are frequent. Children of the Future heads for proggy power metal territory without losing the vocal catchiness, while No More Shadows is an eight-minute plus song that actually works, opening like a Nightwish ballad with crackling storms and panpipes before heading for epic power metal territory, uplifting choruses combined with a bit of classic Rage groove to hold your attention throughout. The muscular writing gives the likes of Nevermore galloping heaviness and the slower Reign of Madness’ themes grounded weight, making each track memorable in some way. Really, I had to look hard to find criticism, and judging small faults like closer Flames of Fate not quite being epic enough seems very harsh; this is a more than excellent album that shows Rage mainman Peavy Wagner was something of a fool to let Smolski go!